Why use our legal journalist services? When you engage a legal journalist you build a primary source of original, fresh content for personality-based or earned-media writing that is uniquely your own take. Simply put, you create your own primary source of news and legal information. It allows you to directly report on important legal matters and helps you circumvent age-old reliance on traditional news sources. With in-person coverage and first-hand investigative reporting you can procure authentic information and be there when it counts. Who is a legal journalist? A legal journalist is the actual pulse of information flow on current events related to legal issues and trending legal topics. A witness of sorts that informs others of their experience or discoveries. Traditional journalism is being disrupted by the internet and cutting edge technologies. Media conglomerates are becoming archaic icons of yesterdays news. Today, as long as your content is socially approved, it can spread across the world with credit to you. Biased or skewed reporting will hopefully be a thing of the past. A legal journalist can also be used to discover new evidence or fresh material for legal reasons on any relevant matter. Provides you with a real lawyer to cover or investigate, as well as research, relevant legal matters. Replaces the middle man with your own direct source of information for complete self-reliance. Fuels social buzz for profound legal content benefits or discovers helpful new legal material. When do I need a legal journalist? When you want an unmatched level of committed content procurement that is entirely original and relevant. The first-hand information collected is then used for the creation or support of other legal content deliverables. Also, ideal for case related sleuthing or coverage of an event, place or person. Should be used sparingly for important or noble motives, unless a law firm’s policy and budget permits otherwise. Where can I find legal journalist services? A content savvy lawyer is sent to cover legal, business or political matters to acquire independent content, or be there in real-time when newsworthy opportunities emerge. 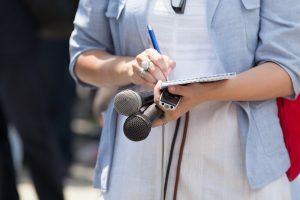 An in-house journalist attends a key event, interviews a notable person, visits an office location, or carries out any task required to fulfill an intracompany goal. Uncovers information pertinent to legal concerns, discovers new talking points on important topics, or simply researches and investigates relevant issues that matter to you. Joint effort between lateral professionals or separate industries to accurately report on any complex subject matter that requires niche expertise and intellectual attention. Any case, statute, policy, history, or any type of real-time information from any local, state, federal or international source permissible to research or observe. Investigative research of news periodicals, magazines, videos, or any type of publication or media that requires a legal mind to identify possible opportunities or legal content. Any legal journalist deliverable that gets the job done. Pick and choose wisely, but if budget permits then definitely diversify. Legal reporting encompasses a broad spectrum of legal journalism services on law topics or related matters. In-house reporting is used to cover and expand internal objectives, personal or interrelated, to the law firm. Investigative journalism explores information sources through sleuth-like probing or inquiries in order to discover new evidence, questions, or answers to existing questions. Collaborative journalism is cooperation between individuals, companies, or industries to jointly elaborate on a shared issue or mutual goal. Seminal cases or laws can also be called judicial or legislature reporting, and concentrates on fact checking and coverage of cases or laws prior to the final outcome. Press or news media is the research and review of written or visual material distributed by the press or media to the public. Contact us to learn more about our unique legal journalist services.